Set among the towering pines which give the region its nickname -- the Piney Woods -- the East Texas region is full of attractions, both manmade and natural. From its namesake pines to some of the biggest lakes in Texas, East Texas has plenty of options for those interested in outdoor recreation. It is also one of the top areas in the country for flower enthusiasts, with a number of flower gardens and trails. Additionally, Texas' oldest town -- Nacogdoches -- is found in the region, as well as one of the state's oldest railways and much, much more. Running on tracks first laid in 1896, the Texas State Railroad crisscrosses the East Texas Piney Woods between the towns of Rusk and Palestine. Riding the rails of the Texas State Railroad is one of the best ways to take in the natural beauty of the East Texas Piney Woods. Tours on the Texas State Railroad are particularly popular during spring when the flowers are in full bloom. Taking this tour in the Victorian era passenger cars of the Texas State Railroad, which was first established in 1881, is like taking a trip back in time. The Texas State Railroad offers a variety of tours and special events. However, the "standard" trip is the Piney Woods Steam Excursion, which is a round trip between Rusk and Palestine. 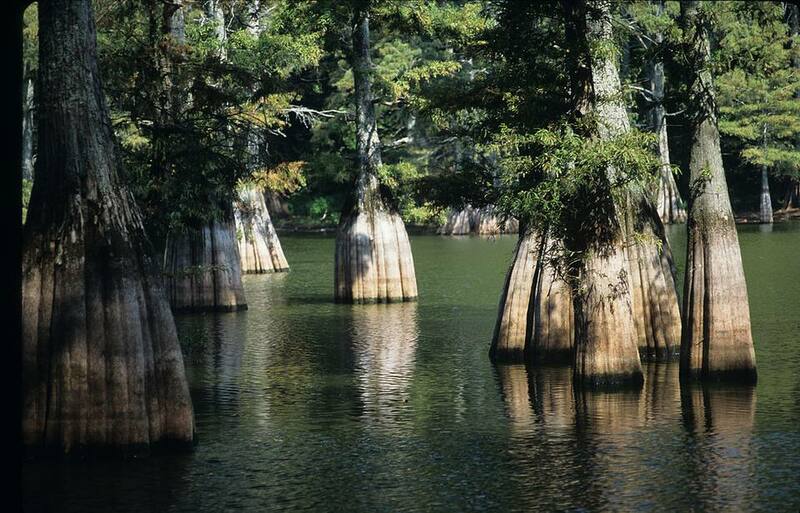 Although the East Texas region is known for its towering pine trees, it is the enormous cypress trees found within the Big Thicket National Preserve which add such a unique characteristic to this national park. As the first area to be designated as a national preserve in the United States, Big Thicket National Preserve covers more than 100,000 acres and offers visitors a dizzying array of outdoor recreational opportunities. Backpacking, hiking, camping, canoeing and fishing are popular activities within the preserve. There are also numerous trails for biking, jogging, bird watching and nature viewing. As the oldest town in Texas, Nacogdoches is definitely a "must see" for any history enthusiast visiting Texas. As one might expect from the oldest town in the state, Nacogdoches is rich in history. Starting in the early 1700s, the Spanish began attempting to establish missions in the area. In 1779, a group of settlers established a local government in Nacogdoches. In 1832, citizens of Nacogdoches drove Mexican troops from the town during the "Battle of Nacogdoches," helping set the stage for the Texas Revolution. In 1845, Nacogdoches University was established. In 1923, Stephen F Austin Teachers College, which later became Stephen F Austin University, was founded. Today, Nacogdoches is a blend of history, Spanish design and Southern charm. Lake Sam Rayburn, also affectionately known as "Big Sam," is the largest reservoir fully contained within the state of Texas (nearby Toledo Bend Reservoir is larger, but is partially located in Louisiana). Impounded in 1965, Sam Rayburn covers 114,000 acres. Located just outside the East Texas town of Jasper, Sam Rayburn has become a popular destination for fishermen, boaters, water skiiers and others looking to "spend a day at the lake." The rose fields of Tyler have become legendary for both the quality of their flowers as well as the sheer magnitude of the fields. Make no mistake, Tyler is reliant on roses. Rose lovers can tour the commercial production fields on the outskirts of town or take a stroll through the magnificent Tyler Municipal Rose Garden, which showcases 40,000 rose bushes representing 500 different varieties of roses. Tyler is also home to the "Rose Museum."